This Project is supported by the National Lottery through the Heritage Lottery Fund on behalf of the Mayor's Office. 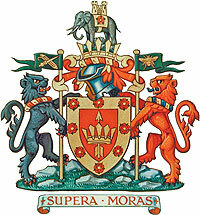 It documents and celebrates the lives and achievements of over 540 local men and women who have served their communities as Mayors of Bolton in Lancashire, England since 1838 and as Mayors and Chairmen of the seven other townships that constitute the present Borough - Farnworth, Kearsley, Horwich, Blackrod, Westhoughton, Little Lever and South Turton. From millionaires to mill lasses, they have all been chosen to represent the best of Bolton at home and abroad - in good times and bad, in triumph and tragedy. Their very different lives reflect the fascinating and interconnected histories of our towns - the links in a chain. Click here to find out more about the Mayoral Insignia including the history of Bolton's unusual Mayor's chain which displays emblems and monograms representing each individual Mayor from the first, Charles James Darbishire in 1838 to Walter Wharton Tong in 1940. To see images of each link in the Chain click here to choose an individual Mayor of Bolton. To get in touch please click here to use our online feedback form.